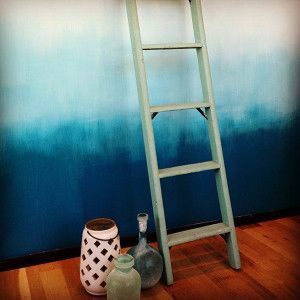 Thinking of painting an accent wall? Consider trying the ombré painting technique. This easy method of blending similar colors from light to dark adds interest to any room. Get your paint brush ready. It’s time to channel your inner artist! Selecting the colors to use is always a tough decision. Keep your choices simple. Pick a main color and two other shades from the same paint sample strip. If you want to be adventurous, try an analogous color scheme where each hue is similar but slightly different. Pick up an artist’s color wheel to help you select the best companion colors (those side by side on the wheel). Select at least three colors – one light, medium and dark. Prep work is key so tape or cover all molding, fixtures and floor. Make sure the wall is clean. Cut down on your workload by selecting a paint that contains primer. Paint the entire wall with the lightest color. You can use a paint sprayer for this step but switch to a roller to paint the different bands. Once dry, mark off three sections leaving a six-inch space in between each area. Paint each section. The darkest color is on the bottom, the medium shade in the middle and the lightest on top. Blend the colors into the buffer areas but do not completely paint inside the six-inch spaces. Mix transitional colors. Mix the dark color with the medium color until you get the shade you want. Mix a second color from the medium and light colors. Add a slow-drying agent. It will give you more time to blend the paint. Apply mixed colors. Paint the six-inch segment with the dark/medium shade and blend into the other colors. With a clean brush, do the same with the light/medium mix. Blend. Using a clean, dry brush, continue to blend the different shades on the wall until you get the look you want. No Mistakes in Art, So Go for It! There really isn’t a way to mess up this technique. Release your inner artist and play around with your wall. The colors should bleed into each other. If you want, use a damp sponge to thin out and blend the paint further or mix a darker shade to add small dabs of contrast throughout. Remember, this is your masterpiece. Once you’ve mastered the ombré technique, murals and portraits can’t be too far behind. From painter sprayers and fans to ladders and nail guns, our expert staff is always on hand to help with your next DIY painting project. Want to know more about how to paint your home? Our blog, Paint Like a Pro – Tips for Painting Your Ceiling and Walls, will help you get started. As always, if you have any questions about pricing or how-to’s, don’t hesitate to contact us. Stop by our store — we’re open seven days a week.